Welcome back to another week of Fantasy basketball. We’re into late-November now, and with the season nearly six weeks in, you have some kind of idea of what your team is capable of. Milk the wire for all it’s worth, peeps! This week, Boston’s 16-game winning streak was snapped by Miami; LeBron James had to leave Wednesday’s game to get stitches and then promptly returned to pour in 23 points — in the fourth quarter; and Houston forward Luc Mbah a Moute went +57 on Wednesday — the best mark in the NBA in the last two decades. Mario Chalmers, PG, Memphis Grizzlies (ESPN: 11 per cent; CBS: 44 per cent): Chalmers is getting a chance to run the Grizzlie offense with Mike Conley currently out. Chalmers has obviously seen a nice boost in minutes, and while his shooting has been inconsistent, he canned two treys on Friday and has generally been a good source of assists, boards and steals. We’d like to see the Anchorage, Alaska-native get to the line more often, but the bottom line is he’s getting enough PT to provide some value and he has managed at least 12 points in two of the last three games. At any rate, it’s great to see the veteran back after he ruptured his Achilles’ tendon a couple of years ago. 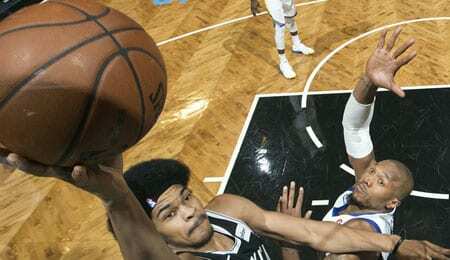 Jarrett Allen, PF/C, Brooklyn Nets (ESPN: 0.8 per cent; CBS: 12 per cent): Since returning from a foot injury a week and a half ago, Allen’s PT has ramped up each game and on Friday — despite poor shooting — the rookie flirted with a double-double while picking up two steals, a block and an assist in a career-high 24 minutes. The 22nd overall pick from the draft started to show a little something something last week (see video below), and is capable of much better rebounding than we’ve seen so far, but he’s starting to provide a glimpse of that, so get him while you can. Tim Frazier, PG, Washington Wizards (ESPN: 0.4 per cent; CBS: 7 per cent): With John Wall expected to be out for the next two weeks, Frazier will take over as the starting PG in Washington. Needless to say, Frazier’s PT has been all over the map, but mostly too little for him to be a factor. When he played 36 minutes last Sunday against the Raptors, however, he flirted with a triple double while drilling his only shot from downtown. Frazier showed promise two seasons ago when he got a chance to play big minutes in New Orleans, so do not underestimate his ability. T.J. McConnell, PG, Philadelphia 76ers (ESPN: 8.1 per cent; CBS: 27 per cent): Another player getting a chance to start because of an injury, McConnell will move into the No. 1 unit Saturday for his first start of the season while Ben Simmons nurses an elbow woe. McConnell already saw an uptick in minutes this week and he’s shot well, especially on Friday when he drained 5-of-7 (1-for-1 from three point range) and both his FT attempts en route to 13 points and seven assists. McConnell’s assist numbers have been typical lately, but we think he’s capable of flirting with double digits given the PT. Remember that he dropped 6.6 dimes per game last season when he was used mostly as the starter. This Pennsylvania native is living the dream in Philly as a solid two-way player. Omri Casspi, SF, Golden State Warriors (ESPN: 0.4 per cent; CBS: 1 per cent): Casspi has been reduced to a complementary role on the powerful Warriors, but he can still score when called up and is getting a chance to start with Kevin Durant (ankle) out. Casspi had been shooting very well until Friday and he’s done a solid job on the boards. Obviously, his touches are down this season, but he could be a fine DFS option on Saturday given his low price ($3,300 on FanDuel). Courtney Lee, SG, New York Knicks (ESPN: 18.1 per cent; CBS: 45 per cent): We recommended Lee in late-February, and it was a solid call as he did a better job of getting to the line in March and then jacked up more treys despite less PT in April. He’s looking good again, with at least 15 points in each of the last two (including a season-best 26 on Friday), superb recent shooting — especially from downtown, and a solid sprinkling of peripheral numbers. Lee’s touches are up recently and he’s done better work on the glass in November. The last time he sunk this many buckets per game was way back in 2009-10 in his only season with the Nets. Kelly Olynyk, C, Miami Heat (ESPN: 15.3 per cent; CBS: 32 per cent): Olynyk has seen an uptick in minutes lately and flirted with a double-double Friday, but he’d get a real boost Sunday if Hassan Whiteside (knee) is unable to play. Just remember that when Whiteside was out last month, Olynyk went off for double digit scoring in five of six games. This could be a sneaky DFS play if you hear for certain that Whiteside is out. Jonathon Simmons, SF, Orlando Magic (ESPN: 28.4 per cent; CBS: 48 per cent): Yes, Simmonds hurt his quad and may not play Saturday, but it’s hard to overlook the 14 shots he put up in just 24 minutes on Friday. If he can get to the line a bit more often, it feels like he’s on the cusp of a breakout. Simmonds’s touches are down this month, so that’s why Friday’s effort buoyed our hopes. We can see him becoming one of the better sixth men for the remainder of the season, especially given his improved shooting. Brown’s last two contests haven’t been stellar, but he started off the week with a career-high 23-point performance. While things still look muddy in Brooklyn, he is racking up a ton of minutes and getting the occasional start, which may ultimately result in more production. Seek Brown out if you need a potential offensive contributor. The highly regarded prospect from Ohio State is showing marked improvement in his second NBA season as he becomes a force in the paint. Sullinger is shooting an impressive .526 from the floor and .864 from the charity stripe. In his last three games, he has registered 17.3 points per game including 26 on Friday against Portland – a great sign after he had missed the previous game with a knee injury. Sprinkle in seven rebounds per contest over this stretch and you have a productive Fantasy power forward.